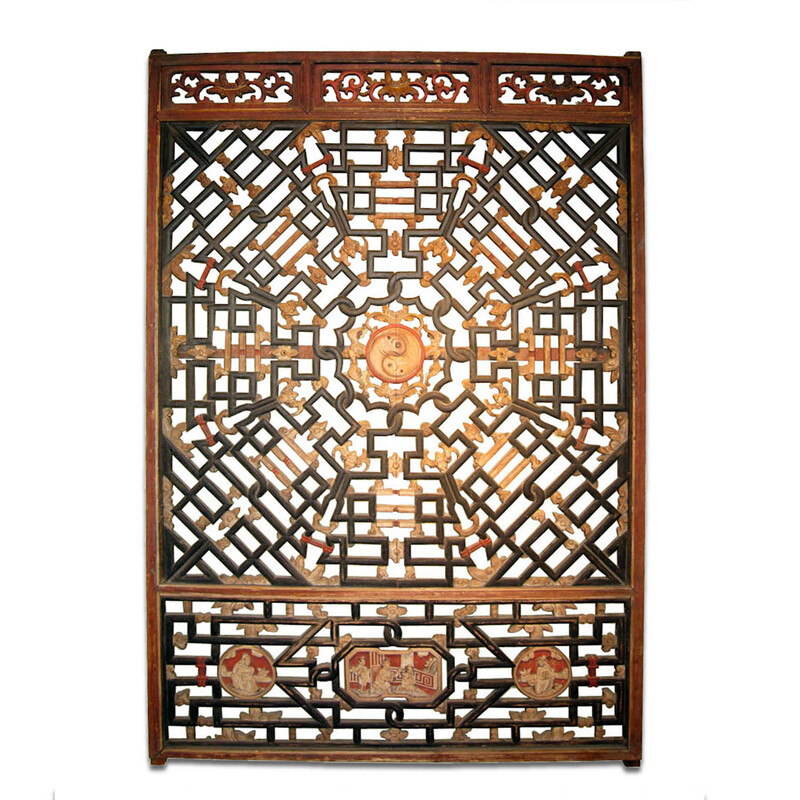 This stunning large size antique Chinese carved lattice window is among the most important Chinese cultural relics. 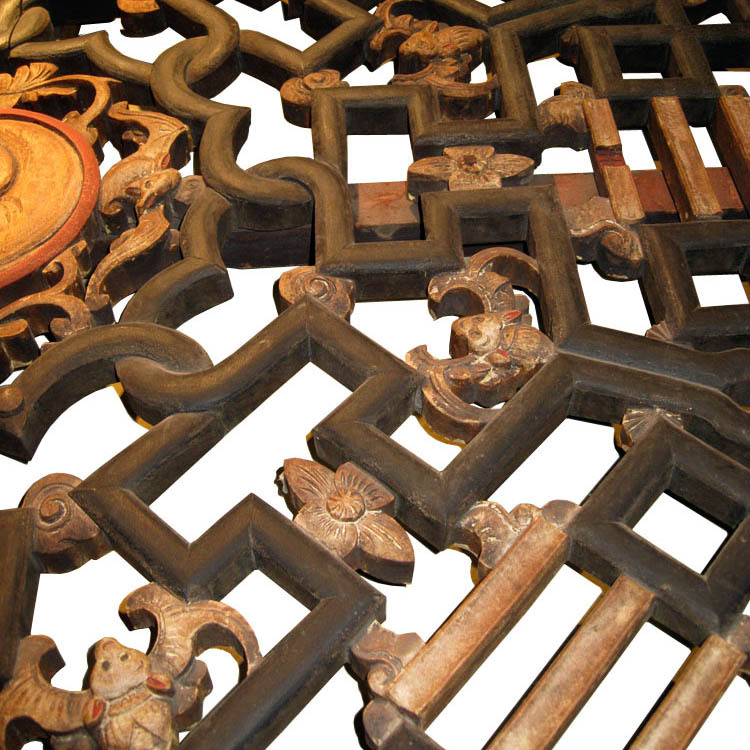 It came from a prominent old Chinese architecture or possibly a Daoist temple. 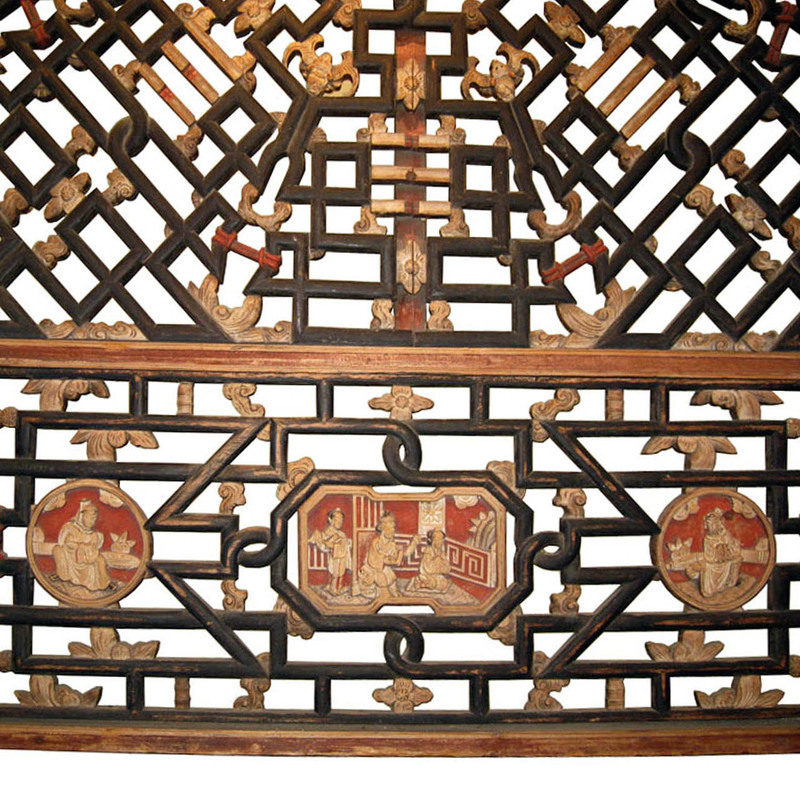 It is by far the most elaborate and the only painted antique window we have seen with the I-Ching Ba-Gua design. 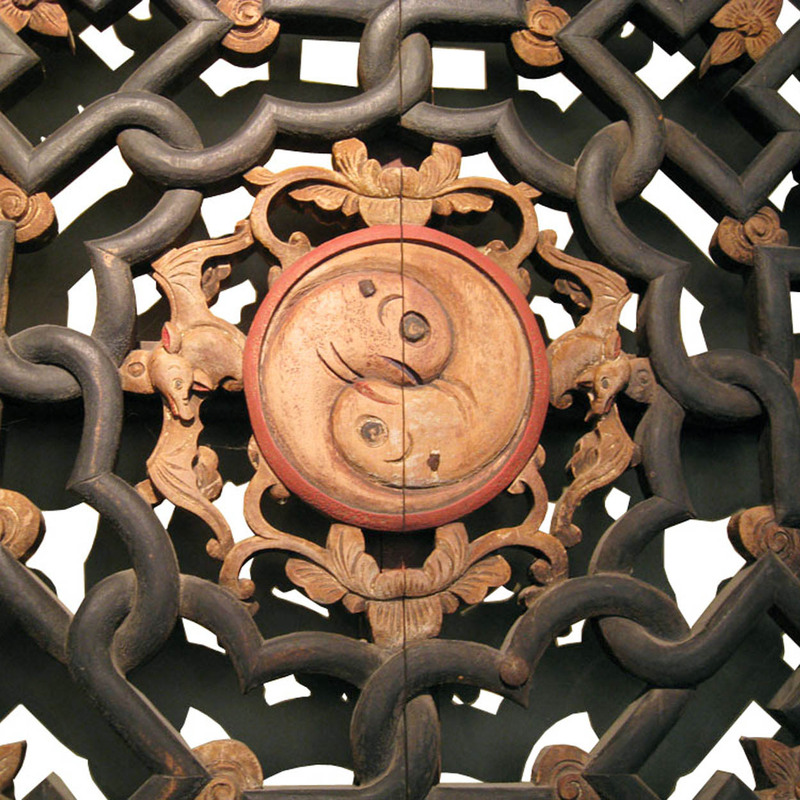 In the middle of the window is a carved Yin-Yang（陰陽）symbol composed of two Ni-Qiu like fish which can represent the chaos of the beginning of the universe. Such concept was further developed into the Heaven (Sun) and the Earth (Moon), the Yin (Earth) and the Yang (Heaven). Yin-Yang is the base and the source of Chinese Daoism（道家文化或道家哲學）. It represents two different life forces with the moon, the earth, being the quiet and the sun, the heaven, being the active. In Chinese Daoism, the Yin and the Yang not only are the two opposing force/ energy, they also correspond and compliment to each other, moving with each other at all time. They are the source of the universe, the creators of all things growing and alive, together they form the Qi energy. On this very rare window, there are two bats with long opening wings at the right and the left of the Yin-Yang. Further out, there are eight bats surrounding the second most inner Eight-Parameters (Eight Measures). Together with the other two bats, there are ten bats in total which is the “extreme blessing（全福).”. Towards the outside, away from the eight bats, one finds three small wooden sticks in white or cream color on each of the eight sides. Some of these white sticks are decorated with carved indented and colored red dots. This red dot separates the single white stick into two parts. As one can see, there are one, two, or three red dots on some sets of three white sticks set or none at all. Together, these elements with the layers of the eight-sided map form a Ba-Gua which is also the Lunar calendar that was made according to the elements of nature and changing seasons. It also has to do with the earth moving by itself and around the moon and the sun. Ba-Gua derived from I-Jing, the ancient Chinese classic, the Book of Change. Ba-Gua is also used in Chinese astrology, Zi-wei-dou-shu, the Life Art of Calculation for Astrology or Prediction. This unusual and beautifully designed and executed old Chinese window, possibly dated back to Ming Dynasty, with the most important Daoist concept and philosophy behind it at this scale is rarely seen and is beyond comparison by other similar windows if found at all.